In my quest to crack the ongoing puzzle of eating well at lunchtime when lunchtime slips to about twenty minutes at most, I’ve started to experiment. This all began when this article popped up on Facebook. It reminded me of something Hugh Fearnley-Whittingstall had done a few years ago, that thing I’d made a note to have a go at and then promptly forgot about. 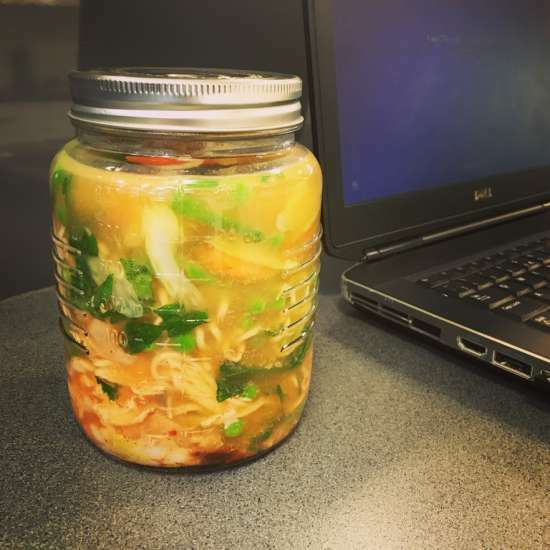 The idea here is that the base ingredients for an excellent noodle soup are packed into a jar, the top screwed tightly on, transported spill-free to work, and finished with water from the kettle. Imagine the humble Pot Noodle, but made with fresh ingredients, and better tasting. To begin with, you need a jar, something fairly wide-mouthed that you can get your ingredients into easily, and more importantly, that you can eat from. I found a couple of glass mason jars for about £2.50 each, and figured that a fiver invested would be recouped if I avoided buying just one sandwich at lunchtime. These are really preserving jars, and they come with a tight-fitting screw top lid, so no leakage expected. Next, the base. A soup is nothing without a good stock, and herein lies a problem. Normally, I’d make a soup base from fresh stock, but that’s not possible in this case, so it has to be a stock cube or bouillon of some sort. Choose carefully. not all stock cubes are equal. Try to find the most naturally flavoured cubes or powder you can – it’s the very heart of your lunch, so worth getting it right. About a quarter of a chicken stock cube is enough for one soup, so crumble that amount into the bottom of the jar. Add some creamed coconut, the kind that comes in a block, about a tablespoon full broken up into small pieces – anything that needs to dissolve should go into the jar in small bits, to make it all quicker. Now some fish sauce, perhaps a tablespoon or more, and a big teaspoon of chilli sauce. I found a fairly mild Korean sauce that tastes earthy and roundly mild, with a nice kick of heat. You have to judge the chilli for yourself. So, now you’ve got the base for a tasty, creamy broth with a nice jolt to it. Add a small handful of cooked and shredded chicken, and a portion of cooked egg noodles, or uncooked rice noodles (they’ll cook through when you add water, but the egg ones won’t). The noodles and chicken create a barrier on top of which go the fresh ingredients – carrots, thinly sliced, a handful of frozen peas, some leaf spinach, corn, green beans, sliced celery, parsley, coriander, beansprouts … anything you can get your hands on. Frozen veg is a good standby, peas and sweetcorn in particular. All of these ingredients can be altered and changed … the base could take on an Indian flavour with a bit of curry powder, you might use a little leftover spaghetti or pasta in place of the noodles, soy could replace fish sauce, a sliced boiled egg stored at the very top, fished out before the water goes in and slipped back in once you’re done stirring, prawns or beef in place of chicken. The next day at work, boil a kettle, and carefully fill the jar so that the ingredients are covered. Stir everything around for a few seconds and replace the lid. Let the jar stand for three minutes, to allow everything to heat through before eating. Very simple, very satisfying, cheap, and quick. Like a Pot Noodle, but far, far better.